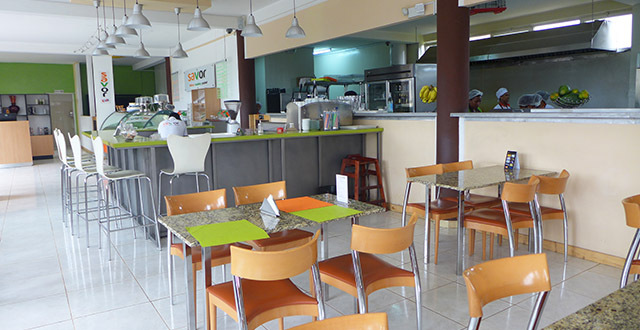 Savor is a newish place in Bole sort of behind Habesha 2000 that has a large menu with a kind of American diner sort of feel to it. The layout is unusual but it totally works. The front area is more of a casual diner style setup with a mix of high chairs and tables, regular tables, and even a couch area off in one corner. Then towards the back it’s a slightly more upscale setup. The multiple windows give it an airy fleeing, and the classical music and open kitchen complete the package. 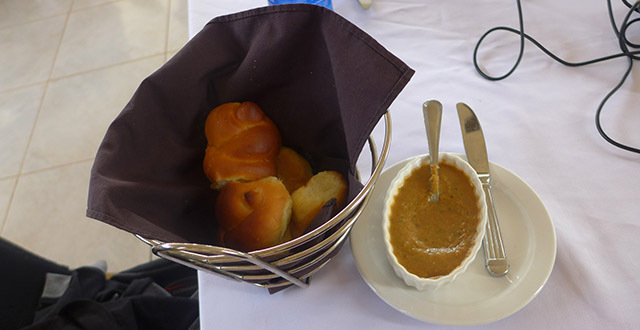 Shortly after ordering, I was brought a basket of buns and a small bowl of a gazpacho type thing. I’ve never had gazpacho in my life so I have nothing to compare it to, but this little treat (on the house) was amazingly flavourful and it’s something I’d order off the menu in future as a light, refreshing starter. I asked for a half order of the Greek salad with imported feta (50 birr plus another 50-ish for the feta) and was brought what I would consider to be a full-sized salad. The thing was quite large and totally would have done fine for me as a complete meal. Plus Savor didn’t skimp on the feta in any way as with most Greek salads I’ve encountered in my time. 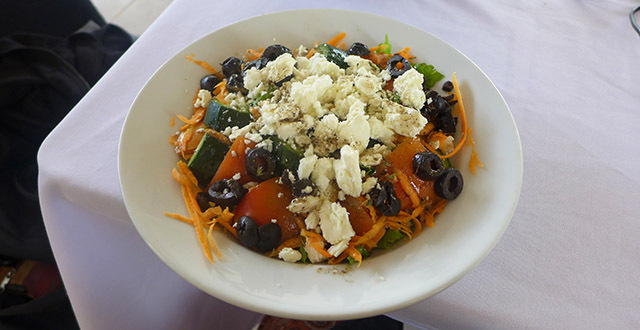 It was packed with feta and olives along with generous chunks of tomatoes and cucumber. I asked for no carrots but the offending carrots appeared anyway but they were sort of strewn around the side of the salad and could be avoided. The light dressing completed the dish and I thoroughly enjoyed it. 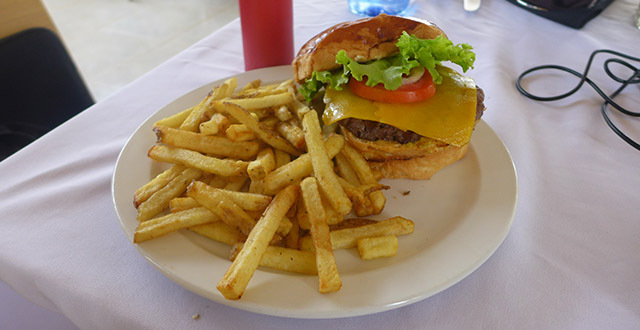 My cheeseburger (140 birr) was good but not great. They skimped a bit on the tomatoes and onions and the bun was weirdly greasy and too dense (a common burger issue in these parts, I think), but overall it was a fine burger experience. The patty was nicely seasoned and the cheese did taste like imported cheddar, as promised. Due to overdoing it on the giant half order of salad, I had to abandon the burger bun and leave half of my fries, but don’t let that deceive you! The meal was pretty tasty. Savor have a nice variety of menu items including pizza and pastas along with a variety of dishes from the grill including various steaks and lamb. There’s a dessert counter up front with cakes, tarts, cream puffs, and ice cream and, though I was tempted to try something, I fear I would have physically exploded due to being so full. So alas, the sweets will have to wait for another time. But they really do look tempting. Including a large water, service fee, and tax, my meal came to 340 birr which for one person for lunch is obviously pretty pricey. To be fair, I would have been totally satisfied with either the half salad or the burger. I only ordered both to try them out for this review. So, while Savor certainly isn’t the cheapest place in town, it doesn’t have to be expensive, either, and the quality of the food is good enough to warrant their asking prices. Service at Savor is very friendly and efficient and, except for getting carrots when I asked for none, everything went smoothly. The wait staff checked in at regular intervals and I even had a visit from a different waiter or possibly the manager to check in to see how everything was, which is always a nice touch. It took around 15 minutes to get my salad and the burger came out about 15 minutes later, nicely spaced so I had time to finish my first course. As an added bonus, Savor has free wifi and it makes a pretty good place to work, as long as it’s not too busy which I could see happening. Luckily for me, the place was about half full when I went so I didn’t feel like I was being rushed or in the way. All up, Savor is a really great restaurant and I’ll be back! Have you been yet? What did you think? Do you wholly agree with my assessment of this place or do you instead think that I’m a raging lunatic who doesn’t know what she’s talking about? Or somewhere in between? Have your say in the comments below!